If you fancy a higher resolution computer monitor or have considered purchasing a 5K or 8K monitor, read on! Personally I have always used high-end computer monitors because they were the only ones that could be correctly calibrated for the full RGB colour space. This was vital in enabling me to obtain accurate colours Â and see smooth tonal graduation when processing my images. I began with a NEC Spectraview 2690 Reference, which was upgraded eighteen months ago to an Eizo CG277 (with the older NEC then becoming my secondary display). The Eizo is superb. It displays very accurate colour and contrast and with 2560 X 1440 resolution it's great for evaluating image sharpness. It even calibrates itself, so that's something I never even have to think about! I had never considered what is in my opinion a major downside of the newer high resolution monitors (for photographers) until I upgraded my MacBook Pro earlier this year. The resolution of its 15” screen is 2880 X 1800 (as opposed to my 27” Eizo monitor which has only 2560 pixels across its width). As soon as I began evaluating images in Lightroom I noticed a problem. I was unable to zoom into the image as much as I was used to. The 100% view just wasn't showing me the detail I needed to be able to see in order to judge image sharpness, say on the eye of a bird. After many hours of experimenting with different settings, searching on Google and generally pulling my hair out, I concluded that it was simply an issue of there being too many pixels in the monitor. Thankfully I had worked this out before I upgraded my office computer to a new iMac last month! Now, there is no doubt that my images look far superior on my new 5k 27” iMac (which has a resolution of 5120 X 2880) when viewing the whole image on screen. The detail and sharpness is incredible. However, it is very difficult to accurately judge image sharpness on the iMac 5k simply because the 100% view is not magnified enough on screen. For example; my Canon 1DX produces files that are 5184X3456 pixels. When I click to 100% view the image barely gets any larger on the iMac monitor because I'm already viewing it at an image height of 2880 pixels (it can therefore only zoom in a bit further to 3456 pixels). Sure, I can choose to zoom into 200%, but this results in the pixels themselves becoming visible, again making evaluating image sharpness quite difficult (although this is what I have to do on my MacBook Pro). I have also tried changing the image resolution on the iMac monitor but I wasn't able to find a setting that helped. 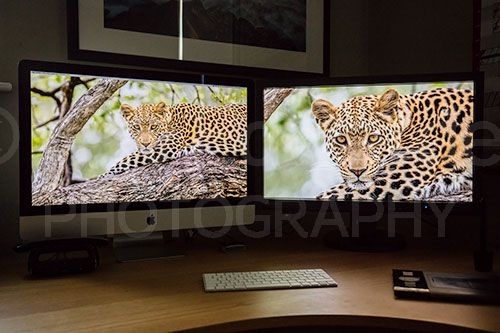 My solution has been to designate my 5k iMac monitor as the secondary display, whilst my 2.5k Eizo remains my primary display for image evaluation in Lightroom and any fine detail work in Photoshop. However, once I have processed my images I then prefer to view them on the superb 5k iMac display! I'm not saying it's impossible to evaluate image sharpness on a higher resolution monitor, but it's certainly much easier and more pleasurable on a lower resolution display. As I said at the start, this is obvious really, but is just something I had never considered! Hopefully I have been able to prevent a similar surprise if you're considering a monitor upgrade in the future!